With this season now completed plans are already in place for the 2 major events on the series calendar. â€œBoth events will be celebrating their 10th birthday which is a fantastic achievement. With almost $40K on offer for these 2 shows already we have pretty good money on offer but if we could increase it that would be great.â€� Searle says. â€œWe are currently working on the rest of our calendar for the oncoming season and release these very shortly. We would also like to mention that if anyone would like to advertise with either of these shows please contact me.â€� Searle tells us. The Mainline DynoLog Dynamometerâ€™s All Star Series were pleased to get the opportunity to congratulate their Drivers, Teams and Sponsors at the end of season Presentation Pit Party at Timmis Speedway last Saturday night. A large crowd stayed for the â€˜Awardsâ€™ ceremony held at the end of the night. In what has become an All Star tradition the show kicked off with a video presentation highlighting the end of a very successful 12th season. â€œThis is a fantastic way start the formalities and reminds teams of what they have achieved over the past 12 shows; we are not too good at formal so making them laugh before we start I believe is a good thing. The lay back Pit Party has been a favourite for all our teams over the years so thatâ€™s why we stuck with it again. â€� Searle says. Rob Barker Encouragement Award â€“ BJ Harris. On a bitterly cold night last Saturday night at Timmis Speedway Mark Caruso took out his second Series Championship. â€œWhat a well-deserved result for Mark & his team, they have been fast and consistent all season, their hard work has finally paid off and now they can claim two series championshipâ€™s to their resume. Mark won his first series back in 2011 and now eight years later has done the same thing; what a true Champion. After the heartbreak they had last season running second after tying with Paul Solomon last year and forcing a tie break countback on A Main winners, they have managed to get it done this season with a 93 point lead. Itâ€™s still only a marginal lead but enough.â€� the Mainline DynoLog Dynamometers All Star Series Promoter Mandy Searle says. Caruso stood on the podium 5 times during the season but only once as the winner. 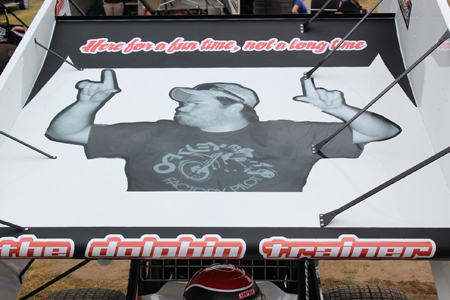 He won the Oval Express Magazine Quick Time Award 5 times claiming the bragging rights to Quick Time for the season. He didnâ€™t have it all easy though destroying his car on RD8 at Heartland Speedway, Moama. The team took home a pile of bits and worked hard to return the following weekend at Sunline Speedway, Waikerie to have their hard work rewarded with the A Main victory. RD 10â€™s Spud Show also saw Caruso leading the early laps only to get swamped where Caruso decided wisely to ease up slightly and ensure he secured more points for the Championship. â€œMark had all his family there to share his victory which was really nice and he also got to race against his brother Steven which was pretty cool also.â€� Searle said. After starting the season off only planning to do a few shows SA96 Brendan Guerin ran second overall. Guerin was another to show speed and consistency throughout all the season and after strong results the first few shows decided to continue. This obviously worked out well for him in the end and he was very pleased with his final position. Brendan, Darryl and their small band of crew members travel out of Broken Hill, NSW every show which is an achievement on its own. V29 Michael Tancredi placed third overall and was also pleased with his final result. Standing on the podium 4 times was an achievement but a couple of DNFâ€™s hurt his points overall. Guru Crew Chief Tony Bartlett was on the tools for Tancredi and the pair worked well together settling Tancrediâ€™s â€˜hammer downâ€™ driving style to make him more consistent. 7 contracted teams locked in the top 7 placings with 1st Mark Caruso -5963, 2nd Brendan Guerin- 5870, 3rd Michael Tancredi- 5763, 4th Phil Lock-5702, 5th James Wren-5652, 6th Dan Evans-5578 and 7th BJ Harris-4795. After the Top 3 Podium on the night teams stayed for the End of Season Pit Party celebrations where awards and accolades were presented. Farrer locks in his first while Caruso locks in his second. With a flag to flag victory Brenten Farrer in the V34 Frijtek Maxim picked up his first Series win for the season Saturday night at Timmis Speedway, Mildura and while he may have won the night it was SA33 Mark Caruso who was the victor of the all-important Series Championship and in doing so making him another two time champ. Both drivers were ecstatic with their results and you could see the relief on Caruso face as he stepped out of his Pro 4 X 4 Cool after scaling. â€œHe only had to start the A and he had won the Series but we hadnâ€™t announced it at that stage. Mark had worked the points out also but his relief was still evident. 12 rounds, thousands of Kâ€™s and lots of pressure all finally done.â€� Searle said. Farrer and V77 Brayden Parr lined up on the front row for the A with Farrer getting the start and Parr perusing him in second. SA10 Steven Caruso, SA44 Dan Evans, SA33 Mark Caruso and V29 Michael Tancredi were all just there waiting for either to make a mistake. Tancredi washed up high in middle of 3 and 4 and bought on the reds by rolling after tagging the wall. Unfortunately this was the end of the night and season for Tancredi. The restart allowed Evans to move on Parr and Steven Caruso up into 2nd. Evans and Parr tangled with 2 to go which also ended Parrâ€™s race and forcing a green, white, checker finish to the night. Farrer took this easily with SA10 Steven Caruso home in 2nd, SA33 Mark Caruso 3rd, SA96 Brendan Guerin 4th and SA44 Dan Evans rounding out the top 5. Young Ben Morris in the SA3 J&J had been running well until his tire blew third race distance and retired to the infield. Another young series up and comer V75 Mitch Smith also had to sit on the infield with mechanical problems. â€œBoth these kids are going to be our next generation and both show talent so it was disappointing for them to finish the night this way.â€� Searle said. Mark Caruso looked like he was going to pick up his 6th Oval Express Magazine Quick Time early only to have his brother Steven beat him by .083 of a second. Carusoâ€™s have certainly dominated the Quick Time award for the season. â€œSo thatâ€™s it now, we are done and dusted for the season and what fantastic season it was. Another one creating milestone after milestone. Mark deserved his win this season and after last seasonâ€™s heartbreak for the entire team it was a great way to finish.â€� Searle tells us. A Main results: 1st V34 Brenten Farrer, 2nd SA10 Steven Caruso, 3rd SA33 Mark Caruso, 4th SA96 Brendan Guerin, 5th SA44 Dan Evans, 6th SA37 Tony Moule, 7th V16 James Wren, 8th V4 Phil Lock, 9th SA16 Jack Gartner, 10th SA69 Cody Atkins, 11th V50 Darren Clarke, 12th SA91 Mick Fox, 13th V77 Brayden Parr-DNF, 14th SA3 Ben Morris-DNF, 15th V29 Michael Tancredi-DNF, 16th V75 Mitch Smith. The Mainline DynoLog Dynamometers All Star Series started back in November and teams have travelled across 3 states, clocked up thousands of kâ€™s and will have competed against each other 12 times all to have it come down to the wire this Saturday night at Timmis Speedway, Mildura to decide who will be the 2018-19 Series Champ. â€œIt really is out of the top 2 guys but the minors are certainly up for grabs and can change depending on what happens on the night. You only have to drop a heat and placings will shift around. We always seem to have fireworks on our final night and I wouldnâ€™t expect anything else this season. Caruso would love to win his second championship after such a disappointment last season when he actually tied with Paul Solomon and we had to use a countback on A Main wins to decide the winner. He has been fast and consistent all season. Guerin would also love to take out his first Championship; and originally not planning on doing it all at the start of the season to now running 2nd is a tribute to the team. Both drivers have had fantastic seasons but unfortunately only one can win. I am pretty excited about it.â€� Promoter Searle says. Timmis Speedway, March 30 with on track action at 5.30pm. â€œWhether its 3 or 20 they are all just as special to me. I put a lot of pressure on myself and we were lucky enough to get away with it. The Wright family have done so much for me over my racing career and I have to win otherwise nothing else suffices. Itâ€™s been 2 ï¿½ years since I ran the 360 and I was a little worried about that but the Bridge is home and it worked out.â€� Jones told us after the Presentations. The night started off well for the Caruso Family with Mark picking up a hat trick with the Oval Express Magazineâ€™s Quick Time Award and making this his 5th for the season. Steven managed to get 2nd quick obviously feeling very comfortable with the 360 in place of his regular 410 engine. SA10 Steven Caruso locked himself into the Pole Shoot Out and started 6 in the A. Moving quickly up into P3 his night was ended when he got tangled up in a yellow and left him on the infield. â€œWith the threat of rain all around us we got pretty nervous as it was spitting when we rolled out for the A but fortunately nothing eventuated and the light drizzle cleared and we managed to get it in. Unfortunately we had to drop our 4 wide salute to the Wright family but I am sure they would understand. With the SA Wingless Title on also both of us managed to get it done and still be finished before 10 for another fantastic night of racing. â€� Searle tells us. â€œRoss is a legend of South Aussie Speedway having raced for almost 50 years in different classes before he passed away with pancreatic cancer. He raced Stock Rods, Super Sedans, Sprintcars and he drove the Jimmy Sills car owned by Kevin Fisher as Bill Wigzells team mate back in the day. He was also a founding member of the Murray Bridge Speedway.â€� Searle tells us as she makes final preparation for the show. Currently sitting 1st is SA 33 Mark Caruso â€“ 4950, 2nd SA96 Brendan Guerin â€“ 4894, 3rd V29 Michael Tancredi â€“ 4805, 4th V4 Phil Lock â€“ 47775 and 5th V16 James Wren - 4698. At this point it really is anyoneâ€™s series to win and all the top 5 will want to secure valuable points as well as win the memorial event. Evans is finding form again after multiple engine issues early in the season and with a strong result last weekend will be one to watch. 410 regular SA10 Steven Caruso will be having his first run with a 360. Caruso has had strong results all season and will probably want to drive by his brother Mark. â€œItâ€™s cool for us to have the brothers running together but we just hope Leo & Mary can cope with it.â€� Searle says. Every year spectators are treated to an action packed main event and this yearâ€™s RD10 of the Mainline DynoLog Dynamometers All Star Series was no different with SA81 Luke Dillon finally taking the checkers for the win. Caruso & Dillon lined up on the front row of the 31 lap tribute race with Caruso getting the start. Ely moved quickly up into second with Dillon, Keller & Quinn hot on his tail. Caruso was looking fast and lead the early stages but after a few more laps Dillon was into second just waiting and when lap traffic came into play he swooped Caruso to first place. The race was hard and fast between the top 5, Dillon, Caruso, Ely, Keller, Quinn with Tancredi, Evans & Guerin adding pressure to the pack. Running flag to flag but just as the top 3 were taking the checkered flag Ely went hard into the wall at turn 4. The top 6 â€“ 7 cars put on a brilliant racing changing positions regularly in the fight to win Spuds night. After all the action SA14 Brendan Quinn took out second, SA44 Dan Evans was in third, Brad Keller driving the Gartner Family Racing SA16 fourth and SA33 Mark Caruso rounding out the top 5. Emotion flowed onto the Dias for presentations and the traditional â€œSpuds Podium Pâ€¦ Up Champagneâ€� as the top 3 took a shower in the bubbly. â€œThis was one of the best races we have seen this season a spectator told me at the end of the night and we would have to agree with them. What a race it was, I would have just loved to be sitting on the hill watching itâ€� Promoter Searle said. The heat was oppressive early in the day with temperatures in the low 40s with hot winds but a cool change arrived around time trial time making conditions easier to race under. Credit must be given to the hard working Mount Gambier Committee & track crew on providing a fantastic race track with all the elements they had working against them on the day and on the build-up week with temperatures unusually high. â€œIt was an awesome night and we are really pleased to announce that the 10th Annual Tyson Perez Memorial has been locked in at Mount Gambier for March 21st 2020, this will be the 8th time the race has been held at the Mount making it truly the home of the Spud Show.â€� Searle said. Who will take out Spuds Show? With the 9th annual Spud Show scheduled this Saturday March 2nd at Borderline Speedway, Mt Gambier and with the names rolling in the talk is now about who will add their name to the prestigious list of winners. Travis Rilat has won the show more than anyone picking up 3 wins; Matt Egel has won twice, Daniel Pestka, Chris Solomon and Mother Nature all having one win each. Chad Ely would be honoured to win his mates show, as would Tim Van Ginnekin. Spud was close friends to both Ely & TVG and as they have both shown in the past with their tribute cars how much this friendship meant to them. It would be an emotional result for either of them to win. This is Elyâ€™s SA22 third & TVGâ€™s V44 second run with the All Stars for season. SA33 Mark Caruso is currently leading the Championship and finished 2nd last year to Pestka. Caruso took out the RD 9 win at Sunline Speedway has always wanted to win Spuds night, will this be his night? SA96 Brendan Guerin sits in 2nd place and with the consistency and speed he has shown all season will be looking for his first A Main win for the season. V29 Michael Tancrediâ€™s association with Tony Bartlett also makes this night special for them. 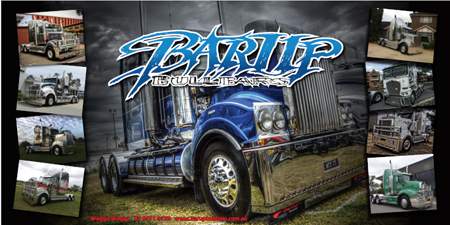 Bartlett was very close to Spud and from his younger years took him on the road racing. Bartlett has also won the show as a car owner with Matt Egel in his car in the past. Tancredi has been on the podium several times this season and will want another win and in doing so making it TBâ€™s third Spud victory. Evans, Lock, Wren, Harris and all the All Stars get to mix it up with the SA locals Dillon, Keller & Quinn who have slotted in 360â€™s especially for the night. â€œWe have to thank GT Bobcat and Central Vic Earthworks involvement with the show. As we have said before GT Bobcat has been a long-time supporter of the show but itâ€™s the first time Central Vic Earthworks have been involved with it. With the extra money paid out we need help to fund this show and without these guys we couldnâ€™t do that. Paying $3000 for the win, $400 to start and total purse of $12K the money is pretty good for competitors.â€� Promoter Searle tells us. Come and join in the celebration on this historic and emotional night that pays tribute to Tyson (Spud) Perez who passed away to young. â€œAnd most importantly after all the serious stuff is over at the end of the night we will have a BBQ, a drink and a laugh just as Spud used to do .â€� says Searle. With the 9th annual Spud Show scheduled for March 2nd at Borderline Speedway, Mt Gambier we are very pleased to announce a new sponsor for the event and welcomes back a long-time supporter. GT Bobcat and Central Vic Earthworks have taken up naming rights for the show. Paying $3000 for the win and total purse of $12K this show is a must attend for 360 teams. Be part of this historic and emotional night that pays tribute to Tyson (Spud) Perez who passed away to young. What a difference a week can make; this time last weekend Mark Carusoâ€™s SA33 Cool car looked very sad and sore after a very heavy impact into the wall at Heartland Raceway. The team made the 9 hour trip back home with a destroyed race car in the back of the transporter planning how much work they would need to complete for the next round the following weekend. All their work paid off and Caruso took out RD 9 of the Mainline DynoLog Dynamometers All Star Series. Leading it from start to finish Mark was elated when he crossed over the scales to officially claim the victory. A usually quiet Caruso climbed on top of the car and fist pumped the air. â€œI canâ€™t ask for better, the night was awesome. It couldnâ€™t have worked out better after last weekendâ€™s disappointment. We got a breather with the yellows coming out with 9 laps to go and I thought I should be able to bring this home. I am normally not very good here but tonight itâ€™s brilliant. Itâ€™s awesome just awesomeâ€� Caruso said at the post race interview. Following home in second was Michael Tancrediâ€™s V29 with SA81 Luke Dillon hot on his tail. After the restart Dillon was working on his move to pass Tancredi but the opportunity didnâ€™t come and had to be content with3rd place. SA96 Brendan Guerin, SA5 Trigga Gates, SA95 Jarman Dalitz were also fighting for positions with Dalitz coming home in 4th place and Guerin rounding out the top 5. SA5 Gates had a good return to the Series after running selected 410 shows and with the car looking fast took out a heat win and 6th place. Another bonus for him as he also managed to collect the Central Vic Earthworks $200 Lucky draw at the end of the night. Mid pack were SA98 Jones, SA90 Lovegrove, SA44 Evans, and SA42 Hendry also waiting for opportunities that did not arise. â€œWe had a small but quality field and with no reds at all thru the night we were pleased with the night especially after last weekendâ€™s car damage at Heartland. With very hot temperature through the day the track crew had their work cut out for them and we have to thank them for their efforts.â€� Promoter Searle said. Heat wins â€“ Mark Caruso, Trigga Gates, Jamie Hendry and Michael Lovegrove. A Main results: 1st SA33 Mark Caruso, 2nd V29 Michael Tancredi, 3rd SA81 Luke Dillon, 4th SA95 Jarman Dalitz, 5th SA96 Brendan Guerin, 6th SA5 Trigga Gates, 7th SSA90 Michael Lovegrove, 8thSA98 Ryan Jones, 9th SA44 Dan Evans, 10th SA69 Cody Atkins, 11th V16 James Wren, 12th Jack Gartner, 13th V4 Phil Lock, 14th SA42 Jamie Hendry, 15th VA2 Boyd Harris, 16th SA91 Mike Fox. 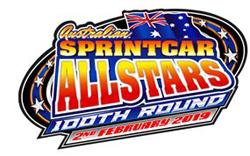 For the third weekend in a row and the third state in a row Mainline DynoLog Dynamometers All Star Series teams are heading off to Sunline Speedway, Waikerie, S.A. this Saturday night. This will be Round 9 of the 12 round series. â€œAfter 100th anniversary celebrations over the past two weekends this weekend should be a bit less pressure, but having said that points for the End of Season Championship will really start to get serious so maybe not.â€� Searle tells us. Currently SA33 Mark Caruso is leading the Championship but after a shocker last weekend at Moama that destroyed his car the team have had to rebuild and recoup. SA96 Brendan Guerin sits in second and is closing on Caruso with only 18 points the difference. V4 Phil Lock is running third with only 78 points the difference between him and Caruso. V29 Michael Tancredi is 4th and V16 James Wren rounds out the top 5. Wren was also involved with Caruso last weekend and has had to burn the midnight oil all week to prepare for this weekend. Current SA 360 State Title holder Dan Evans won at Sunline back in December and is always a hard charger and will want to do well at his home track. Making a return to the series is SA95 Jarman Dalitz, SA69 Cody Atkins and SA5 Trigga Gates. All three have been All Star regulars in the past and are looking forward to running with the regulars again. 410 competitor SA81 Luke Dillon has secured a 360 Maxwell lease engine for the night. SA90 Michael Lovegrove, SA42 Jamie Hendry, S16 Jack Gartner, and VA2 BJ Harris also add to the show. On track action from 5.30. Sunline Speedway, cnr Sturt Hwy & Ziegler Rd. Waikerie. The night was kicked off with an emotional start with a fitting tribute to Phil Lock who was celebrating his 100th series round. Lockâ€™s V4 carried the Australian flag during the national anthem and slowly circulated with the All Star Pace car beside him while all the 22 teams lined the front straight to applaud his efforts. After the celebrations of turning 100 last weekend it is now Phil Locks turn to celebrate 100. The Series stalwart has only missed one round since the series commenced back in 2007-08 and as he rolls into Heartland Raceway for RD8 of the Mainline DynoLog Dynamometers All Star Series this Saturday he clocks up his 100th show. â€œWhat an incredible effort this is. His loyalty, passion and dedication to the All Stars is amazing and we cannot thank him enough for his support over the years. He was the first member of our Hall of Fame â€œLegendsâ€� Award back in 2011/12 and he has won the Drivers Driver Award 8 out of the 10 times it has been given. Our drivers have actually renamed the award and affectionately call it the â€œLockyâ€� Award. Phil has been supported over all these years by the same crew members and these guys must also be thanked for not only their hard work with Phil but also their loyalty to us also.â€� Promoter Searle says. Matthew Reed is returning to try and double up his victory in his V92 Maxim. Reed has 2 series wins so far this season so No.3 would be a bonus. V29 Michael Tancredi showed speed last weekend and wants to repeat his RD2 victory. Driver giveaways and autograph sessions and with cooler weather forecast at Moama it should make for perfect racing conditions. Come and be part of the All Star action and help to celebrate Lockys 100th show. Heartland Raceway, Moama where the actions starts at 6.00pm. Battling the heat, track preparations and finally the lights going out teams got to line up for the A much later than preferred but the wait was well worth it. â€˜Mr Speedâ€™ Matthew Reed and Brendan Guerin lined up on the front row with young charger Jordyn Charge and Mark Caruso behind them. Just as the race was about to get under way V7 Paul Solomon retired with a flat front tyre. Guerin got the lead at the start and looked strong but spun after half race distance in Turn 4 bringing on the yellows forcing him to try again from the rear. What a race; what a night; it had it all - a nail biting Main, drama, emotion and then a party at the end to celebrate. â€œI am so proud of everyone and have to thank them all for being a part of our special night. The drivers, the mums and dads and families, the crews, the sponsors, my team, the track officials and everyone that was there to share our night making it extra special for us. Itâ€™s all of them that make us the All Star Family that we are.â€� Mandy Searle told us at the end of the night. â€œWho would have ever thought all those year ago on February 9th 2008 at Bacchus Marsh Speedway we would get to celebrate 100 rounds. We had 18 cars at our first ever show which a great effort back was then as 360s werenâ€™t very popular. We held our first drivers meeting and amongst those drivers were Phil Lock, Brad Foster, Paul Solomon, Chris Solomon & Tony Moule. These guys are still standing strong at our Drivers meetings today and giving a bit of cheek as our series elders. Then there are the Fatherâ€™s & Sons back then we had Mark Charge, Darryl Guerin, Karl Ender & Chris Evans and we now have their sons competing with us â€“ Jordyn Charge, Brendan Guerin, Scott Enderl and Dan Evans. This is very cool. It is because of guys like these and all the others that we have continued to succeed over the years. What an achievement it is for us. I could not be prouder.â€� Mandy Searle tells us. Current Series Champ Paul Solomon is also returning for the night in the V7 as well as past champ Brenten Farrer in the V34 is also retuning. Both showed strong results at the Grand Annual Sprintcar Classic 2 weeks ago. In the mix we canâ€™t forget the young hard chargers â€“ V77 Brayden Parr, V60 Jordyn Charge & V75 Mitch Smith who are all capable of taking the major points and the money. Reed, Campbell, Holt and many more will all help make the night a thriller. â€œAfter a very successful Mainline DynoLog Dynamometers All Star Challenge held a couple of weeks ago our teams have either had a couple of weekends off or bolted in 410ci engines, but now we are set to get back to business with racing 3 weekends in a row. Any 360 competitor interested in competing is welcome and we would love to have you celebrate 100 shows with usâ€� Mandy Searle says. In front of a full house USA stars and the All Stars put on a night to remember. People will be talking about the spectacle of the Mainline DynoLog Dynamometers All Star Challenge at Simpson Speedway on Saturday night for a long time. â€œMy phone went crazy late that night and yesterday with messages of congratulation and saying it was the best race people have ever seen. The night had it all â€“ a great car count, a Pole Shoot Out that was worth the price of the admission on its own and then to top it off the A Main was a nail biter.â€� said an elated Mandy Searle. Only just flying in from the States in the last day or so both Tim Kaeding and Gio Scelzi had their induction into Heystbury Stockfeeds Simpson Speedway and passed with flying colours. Introduced in the early part of the day to the thousands of locals (Flies) that came out on the sunny day was an experience for them alone and then the serious part of the night came with racing. Both congratulated the track on putting on a great race track which allowed slide jobs and passing and both indicated their wish to return again. TK in the Dan Scott owned USA91 Maxim lined up on pole with a past All Star Series Champ Mark Caruso in the SA33 Cool beside him. Kaeding got the start with Brett Millburnâ€™s VA29 following him into one on the inside line. Yellows were bought on after 9 laps with the top 4 of TK, Milburn, Caruso and Farrer holding their own. Bogucki and Scelzi had been working their way up the field after starting 8th and 9th. 3 short laps after the yellow Scelzi was up into 2nd and hot on the tail tank of TK. Lap after lap Scelzi worked on TK looking for the place to pass him but didnâ€™t get the opportunity. Meanwhile Bogucki, Murcott, Farrer, Ely, Quinn were holding their own battle. Caruso had backed up with an ill handling car and after a touch in the main straight bought out the yellows with only 2 laps to go and left Caruso to be dragged infield minus one front end. At the restart TK ran low into 1 and managed to hold off Scelzi who crossed the line in 2nd and Bogucki 3rd. Unfortunately Scelzi went back to the pits without gong the scales for the Top 5 compulsory postrace weigh in. The Indy Race Parts Team was gutted when advised of the youngsterâ€™s mistake. Current leading the Series SA44 Dan Evans had a shocker incurring engine failure in his second heat which ended his night. V6 Eddie Lumbars night was ruined by engine failure at Engine Starts and as a result the team could not continue. The 2nd Indy Race Parts Team of V2 Domain Ramsay was another that had their hands full all night trying to sort out engine gremlins. The Gremlins won and Ramsayâ€™s night was over. â€œAgain itâ€™s an honour for us to have these yanks run with us. What a buzz for Caruso to line up on the front row with legend Tim Kaeding, and what a thrill for Anthony Foster to start his heat alongside Gio who is a star of the future. They must get such a thrill out of it I know that I do. After a disappointing show last year with rain running the night for us what a way to make a comeback.â€� Searle said. Brenten Farrerâ€™s first night back with the All Stars for the season and he picked up the Oval Express Magazines Quick Time Award with a 13.472. Collecting a 12 month subscription of the mag and also won a complete nerf bar set which was sponsored by Melbourne Stainless Fabrication. Not a bad reward for 13 seconds of his day. After a nail biting 35laps and with Scelzi on his tail Kaeding crossed the line first and secure the win. Unfortunately Scelzi didnt go to the scales after the feature moving the remainder of the field up. Below are the official final placings.